Part auction, part live telethon, The Funding Network is agitating philanthropy and feeding a hunger for purpose. Look out Australia, a new era approaches. Canapés and capacity building are on the menu for social giving initiative The Funding Network (TFN). Established in the UK in 2002, TFN pilot events have been successfully run in Sydney, Perth, and Melbourne, and the Network will be spreading its wings across Australia in 2014. 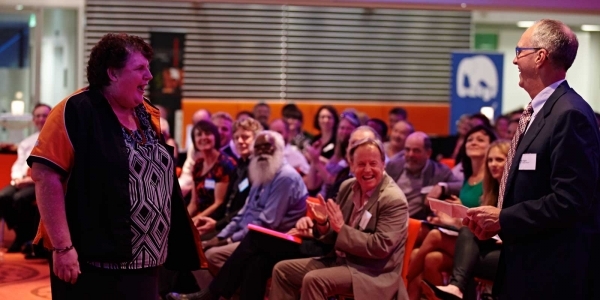 Often described as the “Dragon’s Den of charitable giving”, The Funding Network model is about making philanthropy accessible to everyone in a fun and engaging way, says Lisa Cotton, co-founder and CEO of TFN, and leader of the movement to bring the model to Australia. TFN events are a mash-up of cocktail party, auction room, telethon, and giving circle. At each event, funders gather to listen to the six-minute presentations of four social change projects seeking funding. Following the presentations, and a brief statement by the TFN members who nominated the nonprofits, the audience is left in the communal space to ‘pledge’ (with raised hands – effectively ‘bidding’) their donations to the causes. There is no requirement that attending guests must pledge, and only a $100 minimum donation if they do. Events are open to anyone wishing to attend (those who RSVP in time), but only members can nominate nonprofits to present. “When the pledging starts, there’s a fascinating psychology that takes over the room,” Cotton says. The power of the TFN model is felt far beyond the pledging process. For the early-stage nonprofits on stage, the opportunity to present to, and mingle with, an audience of philanthropically-minded funders doesn’t come along too often. “High profile charities get all the airtime,” Cotton says, “but smaller social change projects, working between the cracks of society, they need a voice too.” Seed funding, or simply new networks, can lead to catalytic outcomes from TFN events. The TFN coaching and capacity building process can be equally valuable. Nominated on a two-page form (the projects must be put forward by TFN members), 10 shortlisted causes go through a phone interview process, due diligence is carried out by members and TFN management, and the four chosen to present receive free pitch training before their big night. In 2014 presentations will be filmed by the Network, and videos of the pitches (“TFN Talks”) will be uploaded onto The Funding Network website for further exposure. Cotton is adamant that involvement by the nonprofits not be “onerous”, and that the process be “as fluid as possible.” Even the 12-month report on funding impact by each of the four causes is kept to two pages. Two pages to apply. Six minutes to present. Two pages to report. Then there are the ripples from the pledge night itself. “There’s definitely a leverage effect,” Cotton says. “Some of the projects see significant funds come in after the event – from people who didn’t want to pledge on the night, or some who want to give more.” In-kind and pro bono assistance also has a tendency to step in, she says. From the three pilot events held in Australia this year, featured causes have already received website design and volunteer program design from supportive attendees. “It’s face-to-face crowd funding,” Cotton says of why the model has enjoyed such success in the UK. For Australians interested in giving, The Funding Network is making itself as accessible as possible. Events cost $30 to attend, and membership (for the privilege of nonprofit nomination rights and event updates) costs $100. “If you really want some skin in the game, you become a member,” Cotton says. Membership and event costs also supports the administration of the model, which is run by a small team. The migration of The Funding Network from the UK to Australia has been welcomed and supported by a raft of heavy-hitters in Australian giving. Philanthropist Allan English, The Trust Company’s Simon Lewis, Social Ventures Australia’s Duncan Peppercorn, and Lotterywest’s Jacquie Thomson were among its 16-strong steering committee, and TFN’s community consultation and pilot phases were funded by a strong cross-section of the private, nonprofit, and corporate sectors. The Funding Network structure consists of a lean back-bone organisation, State Leadership Councils who help spread the model to the widest possible audiences and a National Board, chaired by Allan English. The late Steve Lawrence AO, a pioneer of the social enterprise sector, and a founding director of Social Ventures Australia, was the original agitator of the movement to import The Funding Network to the lucky country, and Cotton says she is proud to share his vision.